There is an audiophile fantasy that I am by no means alone in having. I decide to go to a garage sale because CDs are advertised. I look at the paltry selection -- mostly the sort of lite music that no one actually listens to -- and then spot, out of the corner of my eye, a set of what look like cream-colored room dividers. I count six of them, and my pulse begins to quicken. I walk over to them, and they are covered in a recognizable rough fabric. I look them up and down and they look like they've been in storage for years. Around back I see just what I'm hoping to find: a small badge near the bottom of one panel. "Those were my dad's," a voice from the corner says. "Oh," I say. "Are you selling them?" "You want them?" the voice asks. "We had them in here because we were going to box them up and throw them out." My mind fixates on the word "box." "You have boxes for them?" I coyly ask. "Yes, and they're bigger than the damn things." "Well, I'm not sure they'll fit in my minivan, but I'll take them if the price is right. Boxes too." There is a pause while the voice ponders my offer. I pause, then say "OK" in a calm tone. The voice says, "I didnt think anyone used dressing screens any longer." In case you didn't follow this waking dream, I just bought a pair of vintage Magnepan Tympani speakers with boxes for $10 -- in my mind only, of course.. If I'm in an especially good mood for daydreaming, I would see a pair of McIntosh tube monoblocks behind them when I load the speakers into my car. But why be greedy, especially when something even better actually happened: a semi pulled up in front of my house to deliver a pair of Magnepan MG20.1s for review. The Tympanis were the top of the line in their day, but the MG20.1s are the top of the line, period -- the best speaker that Jim Winey has ever designed. While they don't look much different from the MG3.6es, the MG20.1s are the most realized examples of planar-magnetic/ribbon speaker technology that Magnepan has created. From the front, the MG3.6 and MG20.1 are nearly impossible to tell apart, but around back, the MG3.6's external crossover looks small next to that of the MG20.1, which spans the entire width of the speakers, the stands supporting its considerable weight. The crossover of both speakers is a target for DIYers the world over, who change parts or build new crossovers completely from scratch. You can biamp and biwire both speakers, and the MG20.1s are said to respond well to use with an external crossover. Beneath the acoustically transparent cloth are where the real innovations lurk. The MG3.6 uses a single planar-magnetic midrange/bass panel, while the MG20.1 uses a pair of slightly larger planar-magnetic bass drivers. As a midrange, the MG20.1 has a version of the quasi-ribbon driver used as a tweeter in the MG1.6. Two of these run alongside the planar-magnetic bass drivers. The four bass and midrange drivers are then sandwiched between a pair of CNC-routed MDF frames. 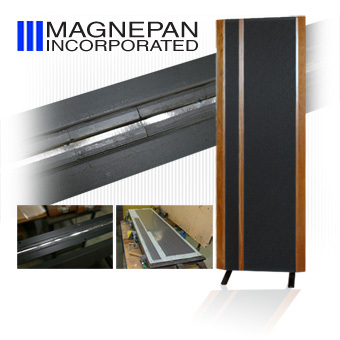 All other Magnepan speakers use a one-piece frame. In a loose sense, you can think of each MG20.1 as a pair of pimped-out MG3.6es along with a pair of quasi-ribbon midrange drivers. The MG20.1 and MG3.6 use the same tweeter -- same size, same materials, same everything. It is arguably the MG20.1's most extraordinary feature. Magnepan builds each of these drivers by hand at their factory. Outsourcing is impossible; there are too many fine points to the creation of this tweeter -- the corrugation done with a specially built apparatus, the strategic placement of dabs of adhesive to allow the ribbon to flex. A metal strip held in place by the driver's magnets protects each tweeter during shipping; even small bursts of air can snap the ribbon. (This is why you should never vacuum your MG3.6es or MG20.1s.) In order to persuade a company to create the special material used for the ribbon, Magnepan had to buy literally a lifetime supply. Each 2.5-micron-thick piece (2.5 x 10-6 or 2.5 x one one-millionth of a meter) is cut to width and length by hand, obviously delicate work. One of the special razor blades used can cut only a single piece of ribbon before it is too dull. How to make MG20.1s. 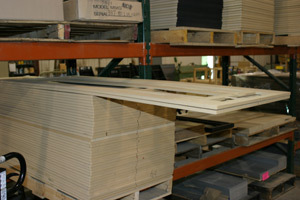 Start with a rack of midrange/woofer panels. 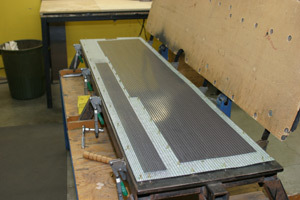 ...in a specially made jig. 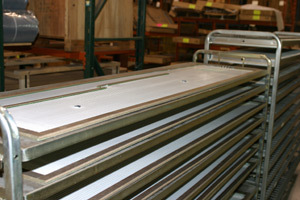 ...and sandwich everything between two MDF frame pieces. Here is another fantasy: When the pair of MG20.1s arrives, I only have to wrest them from their shipping boxes and they are ready to play music. In reality, I have a better chance of finding a pair of $10 Tympanis. Only the Wilson Audio Alexandria X-2 requires more time and effort to set up than the MG20.1. 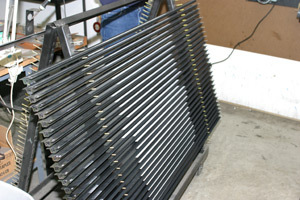 First, the MG20.1s are big and heavy, and thus difficult to move: 79"H x 29"W x 1 5/8D and roughly 140 pounds each. "A pair of barn doors," as one person referred to them. 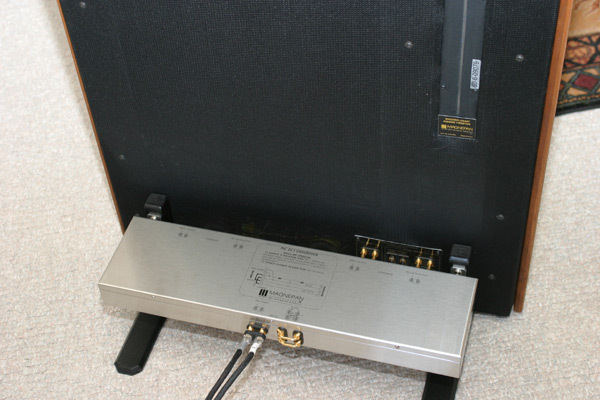 Magnepan includes knobs that screw into inserts on the back of the speakers. They make lugging the MG20.1s around easier, and should be removed after the speakers have been placed. Good thing -- their utilitarian look seems out of place on high-end loudspeakers. They would look right fine on barn doors, however. Once you have become accustomed to the size and heft of the MG20.1s, you are ready to mount their stands, crossovers and ribbon tweeters -- in that order. 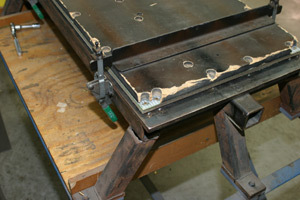 The T-shaped stands screw into pre-drilled holes in the speaker's frame. This is easy enough if you have a helper, and a bit more difficult if you don't. The stands are also the supports for the large crossovers, which attach electrically to the speakers via gold-plated rods. This takes some time because of all the Allen screws to loosen and tighten on the speaker and crossover, but at least you can do it with the speaker upright. Each MG20.1 ships without its tweeter installed in order to protect the ribbon from shipping damage. Each tweeter is held in place with 25 screws. 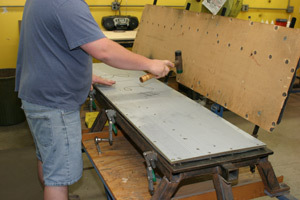 A cordless drill may strip their holes, so all 50 screws have to be driven in by hand. This takes quite a bit of time. Or so I would guess. The speakers I received for review were a pair of Jim Winey's that were borrowed while he was away. Magnepan mistakenly left the tweeters installed, but they arrived without damage. Even so, unpacking and assembling the speakers took me three hours; I suspect tweeter installation would have added another hour. Positioning the MG20.1s is more painstaking work than assembling them. Because of their height, width and dipole radiation (in-phase sound from the front, out-of-phase sound from the rear), the MG20.1s are especially tricky to set up. I remember talking with Warren Gehl, ARC's in-house listener, right before the speakers arrived. "You have an assignment, " Warren said to me. "You have to discover everything great about the 20.1s and write about it." Well, Warren, the first step on this road of discovery is positioning the speakers optimally. Perhaps this is no news, but setup is a greater challenge with the MG20.1s than 99.9% of the speakers on the market. Through much trial, error, and more trial, I found some very sweet spots for the MG20.1s in my large 20'W x 29'L x 10'H room. What I took from this process was not any sort of magical Maggie placement ratio, but instead the importance of a couple of things that should be relevant in other rooms -- and may be the keys to completing Warren's assignment. First, the listening position is an integral part of setting up these speakers -- more so than with most other speakers. Maybe this seems obvious, but in our quest to determine how far each speaker should be from the walls around it, we often forget that our ears are part of the sonic equation as well. After moving the speakers and my listening couch around the room, I came upon the first important truth: Sit as close to the MG20.1s as possible and preferably no farther away than the speakers are apart. As dipoles, the speakers excite my room to a degree that no other speaker has. Sitting closer meant that I was hearing more of the speakers and less of their reflections and the room itself. Another truth may be more a matter of taste than universal applicability, given the different dimensions and uses of every room: Move the speakers as far apart as possible, but not so far apart as to skew the distance to the listening seat. I could seemingly move the MG20.1s away from each other as far as my room would allow -- from wall to wall -- and still hear a solid center image. Yes, the soundstage grew wider, but reflections also became more audible, smearing the sound to an obvious degree. There is a point at which everything aligns -- speaker positions, room, and listening position -- and, in your room, it may mean that the speakers are closer together than you may like given their size, or that you're sitting closer to the speakers than you are accustomed. Unlearn habit and preference to get the most out of the MG20.1s, Grasshopper. You will probably not be able to put them where you had your previous speakers and hear them at their best. "Room acoustics and your own personal tastes will determine whether to position the panels with the tweeters on the inside or outside edge. In most rooms, placing them on the outside will give good dimensionality. Placing them on the inside will, in most cases, increase the central focus and improve imaging." What I found is different and has to do only with integration. No matter the speakers' positions or toe-in, I could hear the tweeters apart from the rest of the sound when they were on the outside, but I couldn't detect them when they were on the inside. Were dimensionality, central focus and imaging affected by tweeter position? Maybe, but I couldn't hear past the sense that the highs seemed to have exaggerated width because the tweeters were as far apart as possible. Therefore, the third truth I discovered was to place the tweeters on the inside; however, I will concede that in a narrow room where the speakers are closer together, outside placement may create a wider, more lifelike soundstage. As Yoda would counsel, "Varied may your mileage be." the sound of the MG20.1s. What is that? Create your own fantasy, or check this space on September 1. Price: $12,500 USD per pair.